We had a photo shoot today with my baby bantams (who aren't really babies anymore). . They got to dig into BEE A Happy Hen (Which is great for all chickens) and it was almost impossible to get photos because they ate it so fast! . And I'm pretty sure my polish bantam (who we've named Slash for obvious reasons) is challenging us all to a hair battle. . Anyone up for the challenge? Ever since I removed most of the roosters from my main coop, the hens have really started laying again. It might be the extra sunlight, it might be the weather (yeah right – it's been in the teens and rainy), or it might be all the herbs we've been adding to their nesting boxes (I'm pretty sure this is why). . By way of apology for all the randy roosters, I've been adding double the shavings and Best Eggs Ever!to their nesting boxes, and the ladies have been responding by doubling their egg output. . My tiny cochin bantams aren't laying yet, but I can't wait – I'll be tempted to incubate their eggs. I'm pretty sure their chicks will be bantam cochin/silkie mixes. . (Did I mention both of my silkies are roosters??) . How cute would that be? I'm very excited because one of my pullets has started to lay, and she's laying GREEN eggs. We lost a couple older layers during the heatwave last year, and one of them was Mama, who was my olive egger. . She left behind a legacy of several chicks last year, but we didn't know who the daddy was. . So I was tickled to reach into their nesting box yesterday and pull out a lovely light green egg! . I also think this officially means spring is on its way! (I don't rely on groundhogs to tell me the forecast – I rely on my own animals, lol). . We also had a fun photo shoot with my bantams yesterday (Yes, another one). We're coming out with coop signs and mugs in the store, and one of my cochin bantams was the pretty face modelling the wares. . 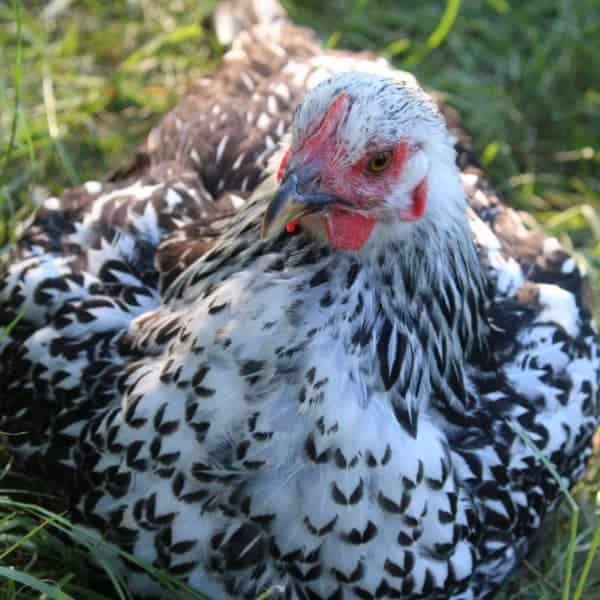 I really like my cochin bantam hens, and if anyone is looking for a sweet, docile breed that's like toy poodle of the chicken world, cochin bantams are it. . She loves being cuddled (and didn't make a peep when I held her for 10 minutes in one arm while I videoed my rabbit napping with my free arm), and did everything asked of her during our photo shoot. . The only time she was nervous was when a roo tried approaching her . Luckily, I was right there to scoop her up, and run off the rooster. Everybody got loose on the farm today. The reason? The naughty goat. . Actually, the ducks stayed in the run, but I think that's less about doing me a favor and more because their pool was full of water. . I've had that flu going around so I wasn't about to chase my silkie roos and all my hens down. . So, out came the BEE A Happy Hen (with mealworms, rose petals, Non-GMO Wheat and more). . And in came all my loose cluckers, strolling along as if it was a jolly spring day. . But the joke's on them, because the ducks got double, lol! Between the polar vortex and the mud, our chickens have been battling the elements. In our area, it's gone from cold to warm and back to cold again. (Think: 20 degrees to 70 for a few days to 50 again). . This means their tiny digestive systems are in overdrive. We've been battling that, the cold, and supporting their guts with WormBGone. . This blend is perfect for winter – it supports healthy digestive system function AND because rosemary, chili, and paprika are key ingredients, it can help the fluffy butts stay warm. . The spiciness of these herbs are traditionally used to increase blood flow and circulation – which can increase warmth. (Without potentially causing a fire) . And if there's any parasites they've happened to pick up, the wormwood and other ingredients are traditionally used to battle parasites! . This is one of my most popular blends – for a good reason! Sharing a TBT photo today from last summer. I'm over winter. . We had a tornado roll through our farm today. The only casualty was my temporary coop that already was on the short list to get scrapped. . Some of my roos lost a home. They'll be fine, and for now, they get the run of the yard. . Everyone in the main coop barely noticed, but they got extra treats because I made them stay in all day in case the wind came back. . Now, it's 20 degrees out again. Does it ever end? I've moved my rooster, Lavender, back into the main coop. He's walking normally again, and I think it's healthier to be around other chickens. . I moved most of the other roosters out so he feels safer. When he's by himself and around hens, he's less awkward, and seems prouder. It's a better life. . He's also pretty popular with the hens, since he's a good protector (as long as he doesn't have to deal with other roosters!) and gentle with them. . To keep him in the best shape, I've been giving him plenty of BEE A Happy Hen (which any chicken can eat) because he loves the bee pollen and wheat, and it's healthy for him. . He seems happy, and so do the ladies!